I feel that my first visit to Luxor has helped me to grow my knowledge of the industry and further my understanding of how it works from new perspective by talking to others with many years of experience and seeing what goes on behind the scenes. It has added a new dimension to what I previously saw as my role and has also fed the appetite of my travel bug, which i’m sure will never truly be full! It was a cold, miserable English afternoon at the office. The window cleaner was on holiday and the windows where filthy enough to block out the sun – if there had been any. Being lowest in the pecking order it was my duty to face the bleak outside and – much like those building the temples – struggle through this heavily laborious task, or face the unimaginably cruel consequences. Shortly after arriving at an inevitable fate – arms tied in a knot whilst staring at a disfigured reflection in the bedazzling gleam of the newly polished panes – my co-worker approached bearing good news of an upcoming educational to – The Land of Luxor! Egypt instantly introduces itself with it’s musky, spicy aroma and baking dry heat. With the sudden added heaviness of extra gravity to the equation, the situation of being herded into a large group of people I was fairly unacquainted with and having to adapt to the warped sands of time – i’m not going to lie – the arrival was by all means disorientating, but my excitement conquered over these feelings and after having time to meet people and adjust I was ready to face the adventure ahead! “Don’t let anyone take yer bags, they’ll want yer money!” I was warned in a cobbled Bristolian accent by one of the group members, who I now know as Chris. Assuming that this was an unlikely situation to happen, I decided to pay little attention to his pearls of wisdom and sooner or later my luggage was floating off in the air towards our coach without my arms attached and I was trapped in a swirling typhoon of hassle for coinage. I’m sorry, I wish I had some money at the time and apologized repeatedly that I was only carrying my debit card – this was not a spell that seemed to work and so I was eventually left with no choice but to leave the situation and get on board the coach. Our driver took us through the mysterious town in the dark of the Arabian night and landed us at the pearly white gates of the magnificent RA II, a well known cruise boat on the river Nile. This would be our humble abode for the next few days. Following the boarding of the vessel, we were introduced to the owners Fadi & Hassan, both charismatic and hospitable Egyptian born men. Once ‘meeted and greeted’ we were ‘wined and dined’ and left with the rest of the evening to swap stories, unpack and unwind. Tonight I would shut my eyes and dream upon the ripples of the majestic river Nile. The next morning was a surreal experience, pulling back the curtains to be struck in the face by the bold Egyptian sun beaming in all its glory through the defenceless cabin window and seeing the swaying palm trees and river folk going about their daily lives down on the front of the Nile (but no crocodiles!). 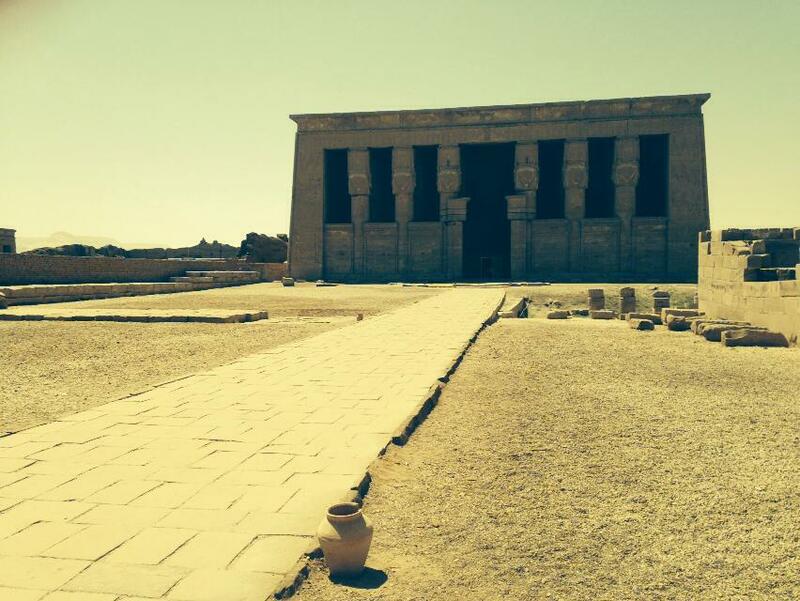 After gaining our days energy at downstairs’ breakfast buffet, we journeyed back up to the reception area and met our tour guide in reception, where we had our introduction meeting and boarded the coach ready to visit the Temple of Hathor. Our trip to the temple was made both entertaining and educational by our knowledgeable tour guide, who told us many stories and facts about ancient times, modern history and Egyptian culture including past pharaohs and rulers, the constant flux of religion and the locals confusion in grasping the concept of the newly installed roundabouts. On our arrival, we toured around the outer walls of the temple and observed the hieroglyphics and large portrayals of Cleopatra IV and Ra which had been masterfully chisled into the temple walls. The inside of the temple was beautifully decorated in hieroglyphics all over the ceiling, walls and the huge pillars that hold it up. Dendera is one of the best preserved temples in Egypt since it’s recent restoration project in which it’s ceiling was cleaned of hundreds of years worth of soot. Half of the ceiling had been left black to show the difference between before and after. Once we had explored the ground floor we were taken up to the rooftop space where the Nuit Chapel resides, containing a plaster replica of the circular Dendara Zodiac disk (the original has been moved to the Louvre) and down an unimaginably narrow flight of stairs, (bearing in mind my height of 6 ft 4), into the dark of the underground crypt. On the way out I met the security who were cracking jokes to eachother over breakfast of flat bread & syrup – which they were kind enough to invite us to join with them until it was time for us to leave. After a long heavy day of wandering around in the dry heat we hopped back on the coach, returned to the RA II and jumped almost immediately into the cool, refreshing pool on the top deck – which was an absolute godsend at the time. This is where most of us stayed and enjoyed the rest of the afternoon and had a delicious Egyptian-style barbecue with lots of mezze, meats and salads, sunbathed by the poolside, drank cocktails & beers together and splashed around. Later on, once the sun had started to go down, we went downstairs for evening entertainment in the bar area which involved a belly dancing performance, a whirling dervish and many drinks.. it was both a very impressive and dizzying experience!